Microsoft Lumia 950 XL builds on the legacy left behind by Windows mobile but with the aesthetics from Windows Phone 7. Microsoft Lumia 950 XL review: Great hardware but Windows 10 Mobile needs to up its game. Microsoft Lumia 950 XL is undoubtedly the most important smartphone for the company. It is one of the first devices based on CEO Satya Nadella’s vision of offering only six devices catering to three different set of users. Microsoft Lumia 950 XL is the flagship that will either lead Windows 10 Mobile to new greats, or will kill its identity totally. One of those risks, any organisation would think several times before taking. Microsoft Lumia 950 XL builds on the legacy left behind by Windows mobile but with the aesthetics from Windows Phone 7. 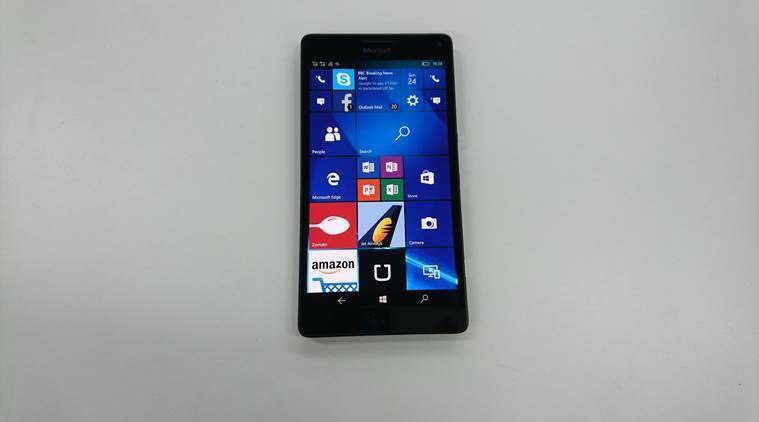 Microsoft Lumia 950 XL shows that it wants to be in the big league. It clearly defines that even with significantly smaller market share, this phone is only meant for enterprise customers and die-hard Windows Phone fans. Isn’t it meant for general consumers? Let’s figure that out in our review. Microsoft Lumia 950 XL is a huge device with really small, but wide footprint. 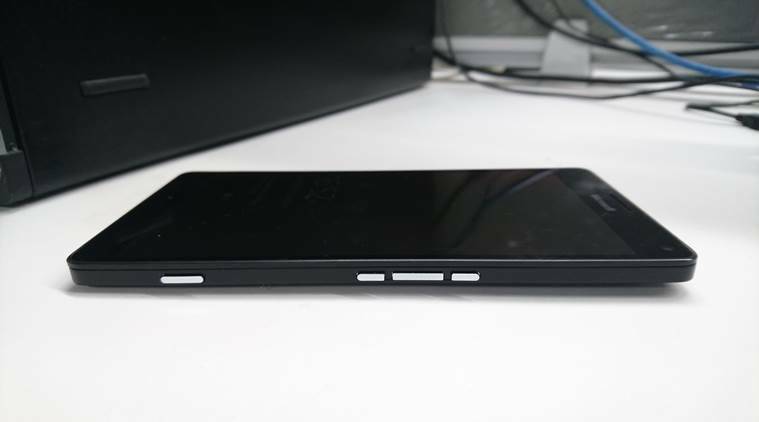 It’s actually as wide and as tall as Sony’s Xperia Z5 flagship, which has a smaller display. While many have criticised Lumia 950 XL’s plastic body, I did end up liking it. The reason being we don’t really see plastic molded flagship smartphones anymore. In fact, Lumia 950 XL has better build than Google’s Nexus 5X, and its plastics don’t make any creaking noises. I found this to be an advantage with the plastic build, the heat dissipated here is not as evident as it would be on a metal and glass smartphone. Microsoft’s own liquid cooling technology keeps the device pretty cool for most part. It’s not great design but I am totally fine with it. A flagship must have a really great display, anything less won’t make the cut here. Microsoft Lumia 950 XL’s display is crisp, and the colours are extremely vibrant. Even the saturation of the display is very evenly matched. The blacks have a deep saturation, and they look beautiful. Since the panel is AMOLED type, you get that Glance screen showing date, time and calendar event as a bonus. There are settings which let you adjust screen’s colour profile further. I kept calling this device Nokia Lumia most of the time. Maybe I’m habituated to Nokia branding but this Microsoft branded Lumia 950 XL flagship builds on all the goodness of Nokia we have known for years. One such area is the camera, the Lumia 950 XL’s camera alone puts it in the league of Samsung’s Galaxy, Google’s impeccable Nexus 6P and dependable iPhones of this world. The 20MP Pureview image sensor tends to behave like a digital camera than a smartphone camera, which is pretty good. Click a picture once and you will realise the beauty of this sensor. The colours are extremely legit and everything comes so close to real. They look extraordinary when you see them on a larger display like a TV or huge monitor. The camera app in the Lumia 950 XL. I must admit that Lumia 950 XL’s camera is not as easy to use as an iPhone’s camera but if you have time to compose your image, the result would be well beyond imagination. Undoubtedly the USP of this camera has to be its manual mode. Sliding the shutter button from right reveals full manual controls with ability to set ISO, exposure time, white balance, brightness and even focus mode. If manual photography is your thing, then this camera will comfort you more than anything else. There is one thing to please any type of audience, that’s battery life. Lumia 950 XL lasted well over one and a half days for me. It comes with a relatively big 3340mAh battery that is user replaceable. Even if the battery dies early, you can swap one easily. Since it uses USB Type-C port, it uses a proprietary cable for charging and it is recommended to carry that one along all the time. Microsoft Lumia 950 XL also supports Qi Wireless charging standards, so it can be charged using any kind of wireless charging pads including those fancy ones from Samsung. Sample shot from Lumia 950 XL. Click on image to see full-size image. On Lumia 950 XL, there is one neat trick called Continuum. Continuum is a way of beaming your smartphone contents to a large screen but here it goes well beyond traditional casting. With Continuum, Lumia 950 XL users can connect their phone to second display via wired Display Dock or wirelessly via dongle. Once connected, Continuum uses Windows 10’s native code to scale things for larger display. There is absolutely no lag or hiccup here. Everything happens in real time and real quick. So a document edited on mobile can be taken full screen and the whole Microsoft Word experience seems like desktop one and not mobile on the larger screen. It truly shows the magic of shared codes been Windows 10 and Windows 10 Mobile. Basically any universal app can scale itself when connected to a Display Dock but there are only a handful of them. Most universal apps come from Microsoft and others like Netflix and Twitter work beautifully too. Transferring full content to Windows 10 mobile. One more advantage for Lumia 950 XL would be its integration with enterprise services. It can connect to your workplace email out of the box and IT admins can configure the device for using first party apps. This one is definitely ready for boardroom and not bedroom. And then there is the brilliant Cortana. Now she can check for LinkedIn profiles of people you are meeting. It can connect with your Office 365 account and even connect with Dynamics CRM for pulling latest updates from reports. She can book an Uber with her own artificial intelligence. I like her abilities more than her voice, and I think she will be the distinguishing factor for Windows going forward. You can even say Hello to your Lumia 950 XL with your iris. Microsoft Lumia 950 XL comes with iris recognition technology which is called Windows Hello. Windows Hello scans your iris with the help of onboard iris scanner and uses the same to unlock the device. Microsoft claims this to be far secure than fingerprint scanners. During my use, it worked 6 out of 10 times and had a latency issue. But I am very sure this tech is coming to more Android flagships this year. It will surely work better then. Microsoft has surely paved the way for future method of device unlocking and that too in a secure way. Even after so many years, the disappointment with Lumia 950 XL remains the app gap. Some of the most used apps on Android and iOS are not there yet. There is no Pocket for all ‘Read It Later’ fans. There is no YouTube app but one can hit the url on Edge browser. The moment you start searching for apps, you realise that Windows 10 Mobile or Windows Phone is a left out ecosystem. Mars may soon get its own habitat, but apps don’t seem to be coming here any time soon. It is not just those missing apps, even the available apps behave strange at times. Facebook is there, but it’s nowhere close to its Android or iOS counterpart. There is Messenger which lacks video calling feature. Then there is Instagram Beta, which doesn’t even support verified profiles. On other platforms, if you are logged into Facebook then you can log in automatically on Instagram but here one needs to type every detail again. These small things make it easy to understand the lack of integration with third party apps. Microsoft Lumia 950 XL has one of the loudest speakers on any smartphone but they are placed in such a way that the audio playback could get tinny at times. Microsoft has still not worked out a way to make its phones charge while it is turned off. Yes, a switched off Lumia 950 XL turns on as soon as you connect it to a charging point. Weird is all I can say. This is a great phone if you work in the enterprise segment and if your company supports Microsoft services like Skype for Business, Dynamics CRM etc. If you are any other kind of a consumer, it is better to steer clear of this device. There is lot to like in Microsoft Lumia 950 XL, especially that beautiful display and a near perfect camera. The interface is highly customisable and different from everything else around but it lacks one core thing called apps. The day Microsoft brings universal apps from top developers, it can aim to be great again. Microsoft accepts that Windows 10 Mobile is a work in progress but the device is real. You can’t live with a great hardware running half baked software. Microsoft Lumia 950 XL shows Redmond’s engineering skills but it’s being let down by its software. Microsoft Lumia 950 XL is a great device for those accustomed to Windows Phone and those in the enterprise side of the world. This phone lets you be more productive than anything else right now. If your life revolves around apps (like mine) then look ahead, you can find that Nexus logo shining in your eyeballs.